entrée, entremet: A couple of French terms which no doubt retain interest for persons attending hotel and restaurant courses conducted under the shadow of French classical traditions, but have ceased to have any real use, partly because most people cannot remember what they mean and partly because their meanings have changed over time and vary from one part of the world to another. Forget them. We might ... follow fashion in food through the revealing history of certain words which are still in use but which have changed in meaning several times: entrées, entremet, ragoûts, etc. Living in San Francisco means visitors, and visitors mean an excuse to wander down Bernal Hill and explore various delicious dinner options along Mission Street. Of course my friends are invariably excellent house-guests and, crucially, open-minded eaters, but they do sometimes find odd things to complain about. My British friend Paul, for example, is annoyed by the interminable questions at cafes in the US ("Single or double? Small, medium, large? For here or to go? Milk or soy? Whole milk or nonfat?"). "Just give me a bloody coffee," says Paul, who claims these coffee dialogs reflect our national obsession with personal control and choice. Other visitors are confused by our parochial word usage. For example, the word entrée in the United States means a main course. Contrarily, as (numerous) guests have informed me, in France as well as in other English-speaking countries, the entrée means what we would call the appetizer course. Thus a French meal might consist of an entrée, the main course (the plat), and dessert, while a corresponding American meal would have appetizer, entrée, and dessert. Since the word entrée comes originally from French (and literally means 'entrance'), my guests are (ever so politely) implying that we Americans must have botched up the meaning of this word at some point. Well, let's go find out! 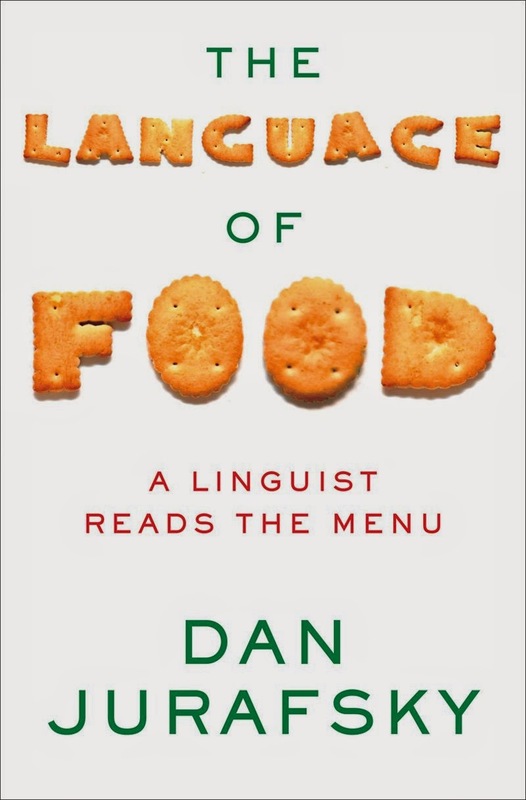 Anyhow, it seems appropriate to begin these notes on language and food by snooping into the history of entrées. Mets qui se sert au début du repas, après le potage ou après les hors-d'œuvre. 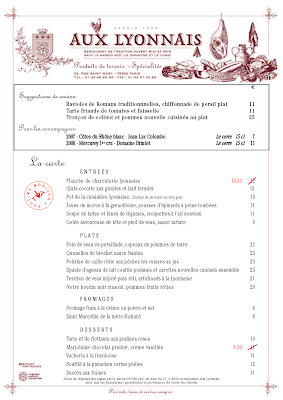 The two menus below, from Alain Ducasse's bistro Aux Lyonnais in Paris, and Range in San Francisco, show the French and American usages. Bon pain. Bon vin. Entrée de table. Potages. Rost. Second rost. Tiers service de rost. Issue de table. Bon pain. Bon vin. Entrée de table. Aultre entrée de table pour yver. Potaiges. Rost. Issue de tables. As these menus show, the entrée is the first course of the meal, there can be multiple entrées, and after the entrée comes the soup, one or more roasts, and then a final course. Over the next hundred years, this sequence began to shift slightly, with the most significant change being that by 1650 the soup was the first course, followed by the entrée. Let's look at Le cuisinier françois, the famous 1651 cookbook that helped introduce modern French cuisine, to see what the word entrée meant at this time. An entrée was a hot meat dish, distinguished from the roast course. The roast course was a spit roast, usually of fowl or rabbit, while the entree was a more complicated 'made dish' of meat, often with a sauce, and something requiring some effort in the kitchen. The cookbook, recently translated as The French Cook, gives such lovely entrees as Ducks in Ragout, Sausages of Partridge White-Meat, a Daube of a Leg of Mutton, and Fricaseed Chicken. An entrée was not cold, nor was it composed of vegetables or eggs. (Dishes that were cold, or composed of vegetable, or eggs were called entremets, but that's a story for another day). So the entrée in 1651 is a hot meat course eaten after the soup and before the roast. By a hundred years later, in the 18th century, the French, English (and colonial American) banquet meal had standardized in a tradition called à la Française or sometimes à l'Anglaise. Meals were often in two courses, each course consisting of an entire table-full of food. All the dishes were laid out on the table, with the most important dishes in the middle and the soup or fish perhaps at the head of the table, entrees scattered about, and the smallest courses (the hors d'oeuvres) placed around the edges (i.e., "outside" of the main stuff). After the soup was eaten, it was taken away, and it was replaced on the table by another dish, called the relevé in French or the remove in English. A remove might be a fish, a joint, or a dish of veal. The other dishes (the entrees and entremets) stayed on the table. Sometimes a fish course was itself removed, just like the soup. Then the joint might be carved while the entrees and hors d'oeuvres were passed around. After this first course was completed, the dishes would all be cleared away and a second course of dishes would be brought in, based around the roast, usually hare or various fowl such as turkey, partridge, or chicken, together with other dishes. 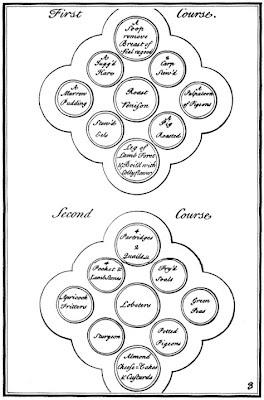 Here's a map of how the dishes were laid on the table in the two courses à la Française from the first cookbook published in the American colonies, Eliza Smith's very popular English cookbook, The Compleat Housewife: or, Accomplished Gentlewoman's Companion, first published in 1727 in England, and published in the American colonies in the 1742 edition. Note the "soop", with the Breast of Veal Ragout remove, and the entrées like Leg of Lamb, 2 Carp Stew'd, and A Pig Roasted. Recall that the classic French roast course consisted of roast fowl; that would be the 4 Partridges and 2 Quails in the second course; roast beef and pork were served in the first course as entrées or removes. Also note that at this point, the word entrée was not yet used in English; at least it's not mentioned in Eliza Smith, and the first usage listed in the Oxford English Dictionary seems to be 10 or 20 years later, in William Verral's 1759 A complete system of cookery, where it is marked in italics as a newly-borrowed foreign word. 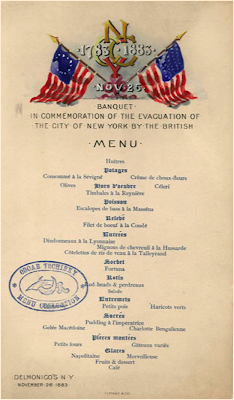 The word entrée maintained this meaning of a substantial meat course served after the soup/fish and before the roast in Britain, France, and America until well after the first World War. 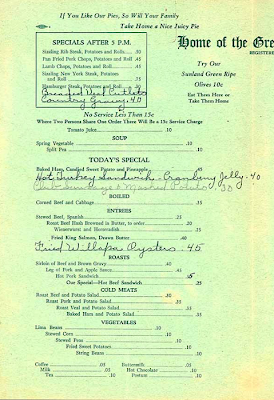 Here are some menus from 1883 (Delmonicos in New York) and 1909 (the Hotel Washington in Seattle) showing this formal meaning; note that these still show a separate relevé (remove) course. By the 1930s, the word seems to be in transition. In a number of US menus from this period, the word is still used in its classic sense as a substantial 'made' meat dish distinguished from roasts, but by now sometimes the term includes fish, and has lost the sense of a course in a particular order. 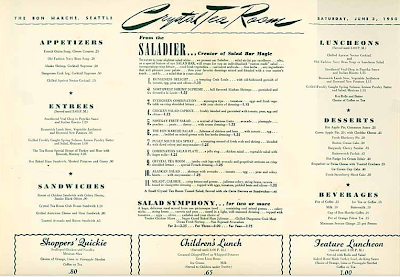 Here is a typical such menu from the Home of the Green Apple Pie restaurant in Seattle in 1937. 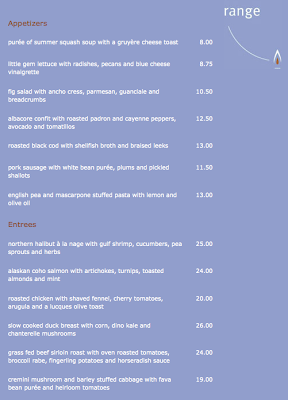 Note that there are still distinct sections for Entrees and Roasts but some of the entrees are seafood. The result is thus a three-course meal consisting of appetizer, entrée, and dessert. What about the French usage? The French use of the word entrée in Escoffier's 1921 Le Guide Culinaire was still the traditional one ('made' hot meat dishes served in the classic sequence before a roast). Escoffier classifies as entrées almost any dish that we would now consider a main course: steaks (entrecotes or filet de boeuf, tournedos), cassoulet, lamb or veal cutlets, ham, sausage, braised leg of lamb (gigot), stews or sautes of chicken, pigeon or turkey, braised goose, foie gras. Escoffier has over 500 pages of entrée recipes. Only roast fowl, and small game animals are classified as roasts, in a small 14 page roast section. Thus for French, the change from the classic usage of a central heavy meat dish to the modern French usage of a light first course must have come after 1921. But the meaning of entrée must have changed by 1962, by which point the recipes Julia Child gives for entrées are light dishes, mainly quiches, soufflees, and quennelles, and we see similar light dishes listed as typical entrées in the modern Larousse Gastronomique, the French culinary encyclopedia. What we have here is a "language maven" complaining about a change in progress: Aux armes! The French masses are using the word entrée incorrectly! Language mavens have probably been around pretty much since there were two speakers to complain about the vocabulary, pronunciation, or grammar of a third. They can be very useful for historical linguists, because grammar writers don't complain about a change in the language until it's basically already happened, at least by a sufficiently large number of speakers. 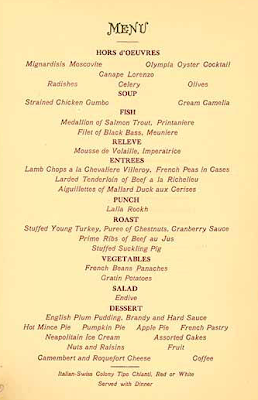 So we can be pretty certain that in popular usage, entrée mostly meant "first course" in French by 1938. In summary, the word entrée originally (in 1555) meant the opening course of a meal, one consisting of substantial hot 'made' meat dishes, usually with a sauce, then evolved to mean the same kind of dishes, but served as a third course after a soup and a fish, and before a roast fowl course. American usage kept this sense of a substantial meat course, and as distinct roast and fish courses dropped away from popular usage, the meaning of entree in American English was no longer opposed to fish or roast dishes, leaving the entree as the single main course. In French, the word changed its meaning by the 1930s to mean a light course of eggs or seafood, essentially taking on much the meaning of earlier terms like hors d'oeuvres or entremets. The change was presumably helped along by the fact that the literal French meaning ("entering, entrance") was still transparent to French speakers, and perhaps as more speakers began to eat multi-course meals the word attached itself more readily to a first or entering course. So both French and American English retain some aspects of the original meaning of the word; French the "first course" aspect of the meaning (which had actually died out by 1651) and American the "main meat course" aspect. With the rise in the popularity and status of ethnic food and the simultaneous decline of the social prestige of French cooking in the United States, I thought I had better check whether the word entrée is still used. I checked the 40 or so (mainly Asian or Central or South American) restaurants in my neighborhood: the word entree was hardly used (appearing on less than 10% of the menus). This suggests that the word is mainly only used for American food of European origin, or perhaps only upscale restaurants. To test this hypothesis, I selected 25 upscale restaurants serving European American cuisine returned from the Google query ("San Francisco restaurants"). 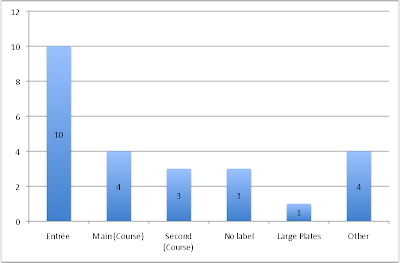 The following table shows how the main course was referred to on their dinner menus. In summary, entree is indeed the most popular way to refer to the main course in upscale European American restaurants, but is generally not used on other ethnic menus.